Hi everyone! I have a repeat tip for you today. I just want to remind you that Pennies are great for filling plastic Easter eggs. I prefer nip in mine, but the kiddos will like the pennies. Today we are focusing on the letter N in the A-Z Blogging Challenge. To see more blogs participating in the A-Z hop, click here. N is for nail clipping. To save money , you can clip your cat’s nails at home. I do most of my cats nails except for KaTwo and Polar Bear- even the vet techs can’t do theirs unless they are drugged. If you have never done it before, you can ask them to show you the next time you are at the vets. There are also a lot of videos on youtube that show you how. 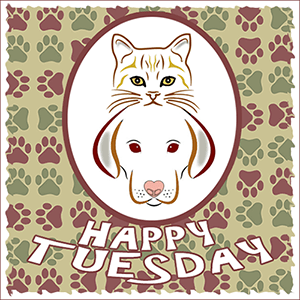 This entry was posted in Blog Hops, Penny's Tips and tagged A-Z Blogging Challenge, Comedy Plus Happy Tuesday Blog Hop, Penny, Penny's Tips by pilch92. Bookmark the permalink. I wouldn’t be in one piece if I let my cats’ claws go Au Naturale. Pennies are good egg fillers. There are only so many jelly beans a person can eat! Oh, we know all about the pennies in the basket, Penny 😀 I still scratch my nails on the wood and the mat, so when my mom comes, she doesn’t have to do it…I guess that why I still do it myself…MOL 😀 Pawkisses for a Happy Day to all of you??? That’s a great tip! In fact, the last time my Mom hid plastic eggs for the neighbors she put $$ in them! I prefer nip Easter eggs too! Great idea about pennies in the eggs! I started early with the nail clippers for Z Cat and she was pretty cooperative. She knew there was a treat coming. Our cats before Z wanted no part of nail clipping! Pennies make cents sweet Penny! That’s a great tip, and getting pennies is better for kids than getting a whole ton of candy, I think! Candy isn’t a good thing. Well a little, but not a lot. Pennies are an excellent choice. Oh the nail clipping. I so remember the blood and kitty scratches. I’ve never had the nerve to trim my cats’ nails. Thus our furniture suffers, but what can you do? Be well! I trim, but our furniture is still in rough shape too. Great idea filling Easter eggs with pennies! When we adopted Angel and Chuck, the deal was that I was in charge of every veterinary visit; The Hubby would NOT go! Somehow, for the very first visit, I talked him into accompanying me. The vet showed him how to clip their nails, and voila, he’s done it ever since. I think I’ve trimmed one cat nail in 15 years! However, Da Boyz don’t like it, so The Hubby just leaves ’em alone…he’d rather have scratched blue jeans instead of making the cats mad at him…LOL! None of mine will let me trim their nails. But they pretty good care of them themselves. That is a super idea to fill easter eggs with pennies. Anyway, great tip about the pennies, Penny! We agree about the nip, though. Great tip. Chocolate works too. Your tip the dentists would like better or would they? Penny, this is a purrfectly festive tip! The kitties here are now informing me that they expect catnip-filled eggs on Easter morning. And, you also just reminded us that we’re coming up on nail trimming day here at our house. We’re all so excited. Purrs! We don’t like our nails clipped…but that doesn’t stop the mom from doing it. Great tip, Penny! Would you believe I have never clipped a cat’s nails? Penny thanks you 🙂 No, I don’t believe it. Pennies in the eggs make for fun ersatz maracas, too. Nail clipping has to be done very carefully around here, and usually not all at once. We do monthly nail trims when we do flea meds. (Our cats have to be on them because we have a dog who goes outside.) Luckily, I’m able to do all the cats at home, but Olive requires two people. That is good you can do them all.